Age-related macular degeneration (AMD) is a disease associated with aging that can gradually destroy sharp, central vision. Central vision is needed for seeing objects clearly and for common daily tasks such as reading and driving. Macular degeneration never causes one to go “black blind.” Almost everyone with AMD, including those with severe cases, can maintain a significant degree of autonomy and independence. AMD affects the macula, which is in the very center of the retina and allows the seeing of fine details. 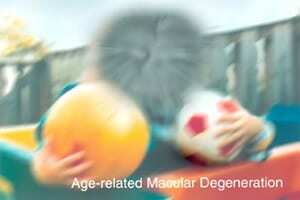 No type of macular degeneration causes pain. In some cases, AMD advances so slowly that people notice little change in their vision. In others, the disease progresses faster and may lead to a loss of central vision in both eyes. AMD is a leading cause of legal vision loss in Americans 60 years of age and older. It is probably found, to some degree, in everyone over 65 years old. Dry AMD occurs when the light-sensitive cells in the macula slowly break down, gradually blurring central vision in the affected eye. As dry AMD gets worse, you may see a blurred spot in the center of your vision. Over time, as less of the macula functions, central vision can be gradually lost in the affected eye. If you have vision loss from AMD in one eye only, you may not notice any changes in your overall vision. With the other eye seeing clearly, you can still drive, read, and see fine details. You may notice changes in your vision only if AMD affects both eyes. If blurriness occurs in your vision, the staff at SoCal Eye will be more than happy to offer a complete examination and explanation of the cause. There are no specific treatments for dry AMD; fortunately, significant vision loss from dry AMD is rare. After dry AMD has developed, the retina may become brittle and allow underlying blood vessels to creep into the overlying retina. These blood vessels can damage the retina by bleeding, leaking, or direct injury. Wet ADM can be treated by medication or laser, if it is detected early. Which form of AMD is more common, the dry form or the wet form? The dry form is much more common. More than 85 percent of all people with intermediate and advanced AMD have the dry form. Yes. All people who have the wet form had the dry form first. The dry form can advance and cause changes to the central vision without turning into the wet form. The dry form also can suddenly turn into the wet form, even during early stage AMD. There is no way to tell if or when the dry form will turn into the wet form. The greatest risk factor is age. Although AMD may occur during middle age, studies show that people over age 60 are clearly at greater risk than other age groups. Many feel that everyone develops some AMD eventually, although it may never become visually significant. Smoking – Smoking may increase the risk of AMD. Obesity – Research studies suggest a link between obesity and the progression of early- and intermediate-stage AMD to advanced AMD. Race – Caucasians are much more likely to lose vision from AMD than African Americans. Family history – Those with immediate family members who have AMD are at a higher risk of developing the disease. Gender – Women appear to be at greater risk than men. Perform daily Amsler grid testing, as noted below. – For dry AMD, the most common early sign is blurred vision. As fewer cells in the macula are able to function, people will see fine details less clearly, such as faces or words in a book. Often this blurred vision will go away in brighter light. If the loss of these light-sensing cells becomes great, people may see a small—but growing—blind spot in the middle of their field of vision. – For wet AMD, the classic early symptom is that straight lines appear crooked. This results when fluid from the leaking blood vessels gathers and lifts the macula, distorting vision. A small blind spot may also appear in wet AMD, resulting in loss of one’s central vision. Our doctors can detect AMD by performing a comprehensive eye exam. During an eye exam, you may be asked to look at an Amsler grid. The pattern of the grid resembles a checkerboard. You will cover one eye and stare at a black dot in the center of the grid. While staring at the dot, you may notice that the straight lines in the pattern appear wavy. You may notice that some of the lines are missing. These may be signs of AMD. In addition to performing a physical eye exam, we also use sophisticated instruments to image the retina and allow the doctors to actually see the layers of the retina as if they were looking through a microscope. The images are similar to those obtained by an MRI, but the testing is done in the office and only takes about 60 seconds. Distortion on this grid may indicate a problem with your macula. However, seeing a normal grid does not preclude AMD. 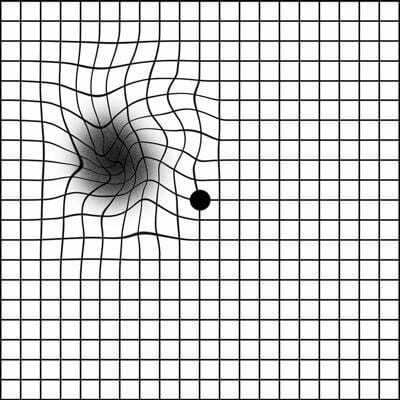 Daily usage of an Amsler grid is often the earliest and easiest way for patients to monitor and detect wet AMD. Early detection of AMD is key to getting the best results from treatment. Using the Amsler Grid to test your vision: Put on reading glasses, cover one eye, position yourself about 18 inches from the grid and stare at the dot in the center. You should be able to see the dot, the lines should be straight, and the squares should be square. If they are not, and the changes are new, please make an appointment with us or your eye care professional to be seen as soon as possible; do not wait more than a couple of days. At SoCal Eye, we have doctors who are fellowship trained in the treatment of diseases of the retina, including macular degeneration. We have all the latest technologies and techniques at our disposal to allow optimal results. Wet AMD can be treated with laser surgery, photodynamic therapy, and injections into the eye. None of these treatments is a cure for wet AMD. The disease and loss of vision may progress despite treatment. Laser surgery – This procedure uses a laser to destroy the fragile, leaky blood vessels. A high energy beam of light is aimed directly onto the new blood vessels and destroys them, preventing further loss of vision. However, laser treatment may also destroy some surrounding healthy tissue and some vision. Only a small percentage of people with wet AMD can be treated with laser surgery. Laser surgery is more effective if the leaky blood vessels have developed away from the fovea, the central part of the macula. (See illustration at the beginning of this document.) Laser surgery is performed in the office. Photodynamic therapy – A drug called verteporfin is injected into your arm. It travels throughout the body, including the new blood vessels in your eye. The drug tends to “stick” to the surface of new blood vessels. Next, a light is shined into your eye for 90 seconds. The light activates the drug. The activated drug destroys the new blood vessels and leads to a slower rate of vision decline. Unlike laser surgery, this drug does not destroy surrounding healthy tissue. Because the drug is activated by light, you must avoid exposing your skin or eyes to direct sunlight or bright indoor light for five days after treatment. Photodynamic therapy is relatively painless. It takes 20 minutes and can be performed in our office. Photodynamic therapy slows the rate of vision loss. It does not stop vision loss or restore vision in eyes already damaged by advanced AMD. Treatment results often are temporary. You may need to be treated again. Injections – Wet AMD can now be treated with new drugs that are injected into the eye (anti-VEGF therapy). Abnormally high levels of a specific growth factor occurs in eyes with wet AMD and promotes the growth of abnormal new blood vessels. These drugs block the effects of the growth factor. Multiple injections are often needed, usually once a month. The eye is numbed before each injection, and most patients report only mild pressure or discomfort. This drug treatment can help slow down vision loss from AMD and, in some cases, improve sight. What can be done if AMD becomes advanced? Once dry AMD reaches the advanced stage, no form of treatment can return what has been lost. However, treatment can delay and possibly prevent intermediate AMD from progressing to the advanced stage, in which vision loss occurs. The National Eye Institute found that taking a specific high-dose formulation of antioxidants and zinc significantly reduces the risk of advanced AMD and its associated vision loss. Slowing AMD’s progression from the intermediate stage to the advanced stage will save the vision of many people. People who are at high risk for developing advanced AMD should consider taking the formulation. You are at high risk for developing advanced AMD if you have either intermediate AMD in one or both eyes, or Advanced AMD (dry or wet) in one eye only. The doctors of SoCal Eye can determine if you have AMD, its stage, and your risk for developing the advanced form. The AREDS formulation is not a cure for AMD. It will not restore vision already lost from the disease. However, it may delay the onset of advanced AMD. Also, it may help people who are at high risk for developing advanced AMD keep their vision. There is no apparent need for those diagnosed with early stage AMD to take the AREDS formulation. The study did not find that the formulation provided a benefit to those with early stage AMD. If you have early stage AMD, a comprehensive dilated eye exam every year can help determine if the disease is progressing. If early stage AMD progresses to the intermediate stage, discuss taking the formulation with your doctor. That being said, there is no evidence that taking AREDS formula vitamins will cause harm. – If you have dry AMD, you should have a comprehensive dilated eye exam at least once a year. The doctors at SoCal Eye can monitor your condition and check for other eye diseases. Also, if you have intermediate AMD in one or both eyes—or advanced AMD in one eye only—we may suggest you take the AREDS formulation containing the high levels of antioxidants and zinc. Because dry AMD can turn into wet AMD at any time, we will provide you with an Amsler grid. Use the grid every day to evaluate your vision for signs of wet AMD. This quick test works best for people who still have good central vision. Check each eye separately. Cover one eye and look at the grid. Then, cover your other eye and look at the grid. If you detect any changes in the appearance of this grid, or in your everyday vision while reading the newspaper or watching television, get a comprehensive dilated eye exam. – If you have wet AMD, and your doctor advises treatment, do not wait. After laser surgery or photodynamic therapy, you will need frequent eye exams to detect any recurrence of leaking blood vessels. Studies show that people who smoke have a greater risk of recurrence than nonsmokers. In addition, check your vision at home with the Amsler grid. If you detect any changes, schedule an eye exam immediately. If you have lost some sight from AMD, don’t be afraid to use your eyes for reading, watching TV, and other routine activities. Normal use of your eyes will not cause further damage to your vision. If you have lost some sight from AMD, ask us about low vision services and devices that may help you make the most of your remaining vision. In addition, there may be surgical options, including surgical implantation of an intraoculor telescope. Many community organizations and agencies offer information about low vision counseling, training, and other special services for people with visual impairments. The doctors and staff at SoCal Eye work closely with low vision specialists and organizations in our community to maximize and maintain each of our patient’s independence. This research should provide better ways to detect, treat, and prevent vision loss in people with macular degeneration. Note: This information was provided by The National Eye Institute (NEI). The NEI is part of the National Institutes of Health (NIH) and is the federal government’s lead agency for vision research that leads to sight-saving treatments. The NEI plays a key role in reducing visual impairment and blindness.